WTI crude prices are in the $45.75/b-$46.00/b range this morning. Prices sagged below $46/b in early morning trading. Yesterday, WTI prices managed to maintain a net-positive position for the day, though gasoline and diesel both closed the day lower. 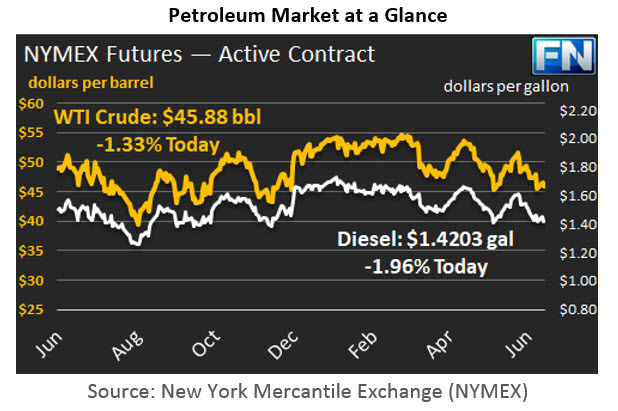 WTI opened at $46.01/b today, an increase of $0.21, or 0.46%, above yesterday’s opening price. The gain has been reversed, however. Current prices are $45.88/b, down by $0.20 from yesterday’s closing price. Diesel opened at $1.4232/gallon this morning. This was a decrease of 0.8 cents (0.56%) above yesterday’s opening price. Current prices are $1.4203/gallon, down by 0.51 cents from yesterday’s closing price. Gasoline opened at $1.4877/gallon today, a drop of 1.4 cents, or 0.93%, from yesterday’s opening. Prices are $1.4807/gallon currently, down by 0.73 cents from yesterday’s close. Crude oil futures received some support from a Bloomberg survey pointing to a resumption of crude inventory drawdowns, anticipating a stock draw of 2.25 mmbbls. Last week’s surprise build brought prices down sharply. The Bloomberg survey also predicts a 1.15-mmbbl drawdown of gasoline inventories. The Energy Information Administration (EIA) will release official data tomorrow. The Federal Open Market Committee (FOMC) begins its two-day meeting begins today. Economists are nearly certain that Fed Chair Janet Yellen will announce a rate hike at her press conference tomorrow. The market anticipates one more rate hike this year, possibly in December. A looming issue now regards what the Fed will do to start trimming its $4.5 trillion balance sheet. The EIA has released data on gasoline and diesel retail prices for the week ended June 12th. Prices for both fuels fell significantly at the national average level, as well as in all five PADDs. Gasoline retail prices fell by 4.8 cents/gallon. Diesel prices dropped by 4.0 cents/gallon. Gasoline pump prices averaged $2.366/gallon during the week, breaking through a significant barrier by being 3.3 cents per gallon below last year’s price for the same week. Diesel prices were 9.3 cents per gallon above last year’s price. Details follow in our second article.